In just five months, the Dutch private spaceflight project Mars One has gathered 202,586 applications for a one-way trip to Mars. Applicants from over 140 countries had to submit a video explaining why they'd be a good candidate for the mission. 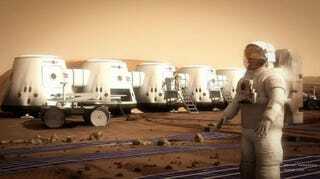 The Mars One foundation is a non profit organization with a goal of sending a manned space mission to Mars by 2023. Collaborating with the SpaceX company, they will try to launch people to Mars starting in groups of 4. Before that, applicants will be screened and a select few will go through a seven year training program starting in 2015. The whole process may even be part of a reality TV show when the time comes. Because this is a one-way ticket to Mars, these people are committing to leaving the earth behind and eventually dying on Mars.